President Donald Trump’s prolific Twitter output has become source material for news outlets covering him – and during the early days of his administration, stories that included his tweets stood out from those that did not. They were more likely to have a negative assessment of the administration’s words and actions and to include a challenge by the journalist to something Trump or a member of his administration said, according to a Pew Research Center analysis of more than 3,000 stories across 24 media outlets. A recent report from the Center found that about one-in-six news stories about the president or the administration (16%) during the first 100 days of Trump’s presidency included one of his tweets. Another element measured in the study was whether statements from the journalist or statements cited in a story gave an overall positive or negative evaluation of the Trump administration’s words or actions – or fell somewhere in between. 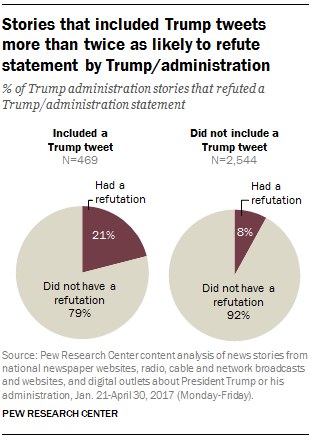 Additionally, stories with at least one of the president’s tweets were more likely to include a direct refutation by the reporter of something the president or a member of his administration said – whether it was a refutation of the tweet itself, a statement related to the issue referenced in the tweet or another statement altogether in the story. Overall, one-in-ten stories included a direct refutation. This jumps to about one-in-five stories with a Trump tweet (21%), more than double the share that did not contain one (8%). 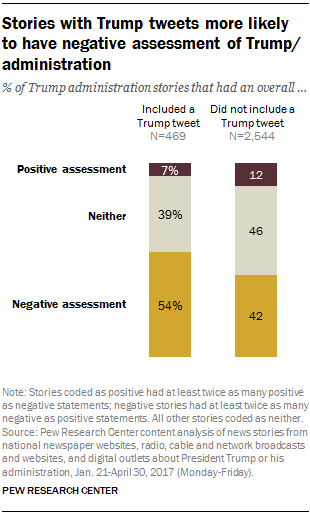 Amid these differences between stories with and without the president’s tweets, there was one notable similarity: A large majority of both those with a tweet and those without one structured their coverage around character and leadership rather than policy. However, those with a tweet were even more likely to focus on the president’s leadership and character (85%) than those that did not (72%). Note: Read more about the study’s methodology here.